Attended by hundreds of guests, the 3rd Annual CCHR Humanitarian Awards Banquet once again honored the many dedicated volunteers and supporters of CCHR for their work in the field of mental health reform. The president of the Florida chapter of CCHR presented attorney Carmen Miller with the 2018 Humanitarian Award for her work to educate citizens on their rights under the mental health law. Mrs. Carmen Miller received the CCHR Humanitarian Award for her work in the fight to protect individuals from fraudulent involuntary psychiatric examinations. 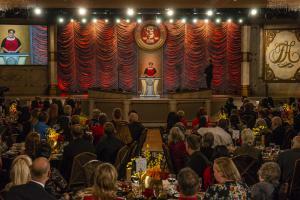 CLEARWATER, FLORIDA, UNITED STATES, November 6, 2018 /EINPresswire.com/ — Distinguished Florida attorney, Mrs. Carmen Miller, received the CCHR Humanitarian Award during a banquet held at the historic Fort Harrison in downtown Clearwater for her work in the fight to protect individuals from fraudulent involuntary psychiatric examinations known as Baker Acts. Attended by hundreds of guests, the 3rd Annual Citizens Commission on Human Rights (CCHR) Humanitarian Awards Banquet once again honored the many dedicated volunteers and supporters of CCHR for their work in the field of mental health reform. New this year was the presentation of the CCHR Hall of Fame Award, which was presented to Mr. Marlin Anderson. A longtime resident of the Tampa Bay area, Mr. Anderson has actively worked to expose mental health abuse since 1978 having appeared on radio shows and as a speaker at numerous events designed to raise awareness on this important issue. Most notably he was part of a team that brought to light elder abuse and helped restore rights to seniors that had been unjustly declared incompetent. 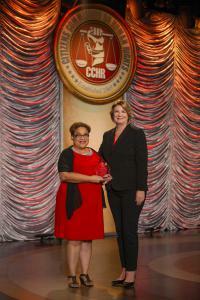 This year’s recipient of the prestigious CCHR Humanitarian Award was local attorney Mrs. Carmen Miller for her work to educate citizens on their rights under the mental health law. A member of the Florida Bar for over ten years, Mrs. Miller served the people of Tampa Bay as an Assistant Public Defender for over eight years and has represented thousands of clients in the criminal justice system. During this tenure, she could not idly stand by while her fellow men and women were being unjustly sent for involuntary psychiatric examinations so she began to specialize in Baker Act cases. Currently a private attorney she expanded her legal skills to also include civil law, focusing on family and elder abuse cases. Citing the abusive use of the mental health law, Mrs. Miller vowed to connect with other attorneys stating that there is potential for litigation against those abusing the Baker Act and the potential to create statewide impacts. “We’re going to go after the pocketbooks of these institutions and we’re going to go after involuntary commitment. We can be the beacons of light for the rest of this country, and most importantly, we can keep people from being unnecessarily Baker Acted,” said Miller. Launching a campaign to put an end to this violation of rights in 2016, the Florida chapter of CCHR, a non-profit mental health watchdog dedicated to the protection of children, has educated more than 200,000 families on their rights under the law in addition to calling upon Florida lawmakers to eliminate the unjust Baker Acting of children. For more information on CCHR’s campaign to eliminate inappropriate Baker Acting of children please visit 5 Simple Steps to Help Protect Your Child, or contact CCHR at 727-442-8820. About CCHR: Initially established by the Church of Scientology and renowned psychiatrist Dr. Thomas Szasz in 1969, CCHR’s mission is to eradicate abuses committed under the guise of mental health and enact patient and consumer protections. L. Ron Hubbard, founder of Scientology, first brought psychiatric imprisonment to wide public notice: “Thousands and thousands are seized without process of law, every week, over the ‘free world’ tortured, castrated, killed. All in the name of ‘mental health,’” he wrote in March 1969.